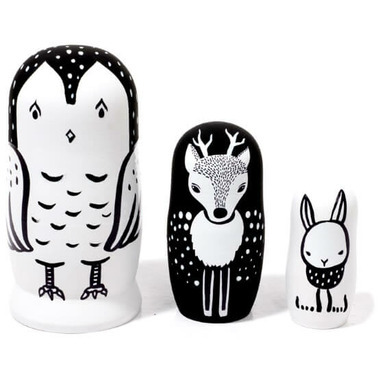 This set of 3 Nesting Dolls features woodland creatures – the Owl, the Deer, and the Bunny. The three come packaged one inside the other and are hand painted in a village in Russia especially for Wee Gallery. Your Wee Gallery Nesting Dolls come packaged in a beautiful wooden box for safe keeping. Small Parts Warning: The Owl is small enough to require a small parts warning. This item is rated for 3+. It is not a toy for babies or toddlers. Please keep out of reach of children below 3.